Our brand new range of Martello fine white china deserves extra special attention from London caterers and other event professionals around the country. Ultimately, this is a step up from standard white china options and gives you the ability to present your food in a modern and unique style, perhaps presenting each course you serve on a different patterned or coloured plate which seems to be very a-la-mode in the London event circuit at the moment. 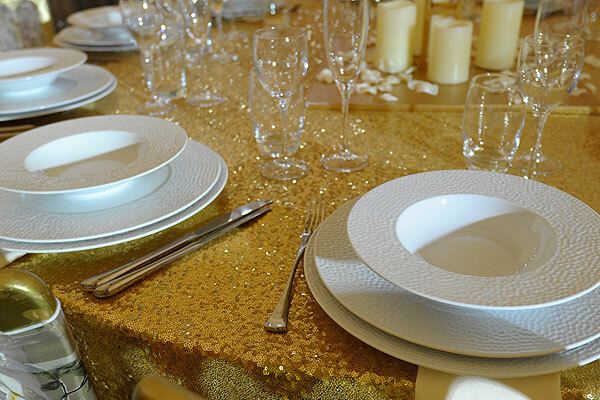 In this range, we offer three different sizes of plates, which enables you to choose the best fit for YOUR event. The plates and dishes within this range are not designed to be necessarily matching for different courses, but the fact that we don’t define a starter plate or main course plate, for instance, means that you have the ultimate in choice and flexibility when it comes to what courses you serve on which plates. The design of the Martello plates and dishes is stylish and exciting, with an indented – almost golf ball style – pattern running around the outside of the pieces, which is sure to provide a talking point for your guests. As the market evolves, it’s important to move with the times – and sometimes even set the new trends – and this is why our Martello range of fine china is just a small part of our new ranges of modern event crockery, glassware and cutlery which includes coupe plates, coloured dining plates, stemless wine glasses and gold cutlery to give our clients in London and across the UK the ultimate in choice for their upcoming event or occasion. Contact the leading event hire company in London today at Event Hire. We look forward to hearing from you soon.